(18 September - Cropchoice News) -- In a discovery that will fan consumer fires against biotech food, Friends of the Earth reported today that it has found an unapproved GMO feed corn on US supermarket shelves. The activist group says Taco Bell taco shells that it analyzed tested positive for a potentially allergy-causing Bt gene called Cry9C. The announcement will raise the level of buyer concern, both domestic and foreign, about US grain handers ability to segregate biotech varieties. Cry9C comes from StarLink varieties made by Aventis. Starlink has not been approved for human consumption by the Environmental Protection Agency because the gene appears to have the potential to trigger allergic reactions in consumers. The Washington Post reported today that the Food and Drug Administration said the reported contamination would be "unlawful" and has started an investigation. Finger pointing has already begun as activists, the company, and federal investigators rush to get to the bottom of the problem. The testing was conducted on supermarket-bought shells, not those sold in restaurants. According to the Washington Post, the shells were made in Mexico; but the grain was provided by a Texas company that "ordered a conventional form of corn" from elevators in 6 different states. Friends of the Earth is calling for an immediate product recall and says this is "the tip of an iceberg." 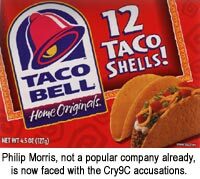 Taco Bell, which belongs to food and tobacco giant Philip Morris, still isn't sure that Cry9C is there. A company official said "This is a serious issue and [Philip Morris subsidiary] Kraft is doing everything we can to confirm whether or not this material is present in the product ... If it is confirmed, we will immediately take--in consultation with the FDA--all appropriate steps." Friends of the Earth hired the Iowa company Genetic ID to conduct the test, which was based on PCR technology. Genetic ID says it does its tests twice to ensure reliability. All sides say they'd like the government to repeat the genetic test to confirm - or disprove - the results. Allergenicity issues are looked on very seriously by scientists and food and environmental activists because of the potentially deadly results. Anti-GMO groups have continued to cite the research Pioneer Hi-Bred conducted on biotech varieties enhanced with a Brazil nut gene. The experiments, which were abandoned, used a gene that was capable of inducing fatal reactions in people with allergies to nuts. If teh Starlink reports are correct, the Taco Bell contamination would be more worrying for consumer advocates because the product made it all the way to the supermarket.